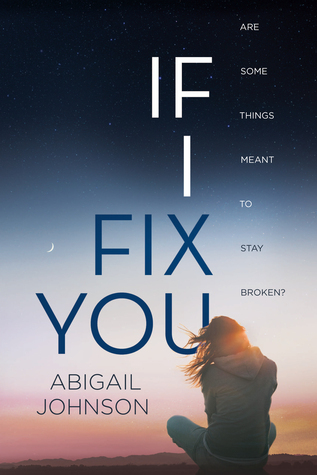 I had my eye on If I Fix You by Abigail Johnson for a while before I had the opportunity to pick it up, and when the chance arrived to finally read the book, I jumped on it. If you know me at all, you'll know that I absolutely cannot resist a good contemporary novel, and that's definitely what this book was! There are a lot of interesting characters in this book, including the main character, Jill. Despite some of the things she's gone through in the past, she's a trooper. Strong-willed and determined. I love that she has this fascinating love for cars, and, she has a pretty awesome dad as well. Her friends are pretty great too. And when a new boy moves in next door, things really get interesting. As I mentioned above, If I Fix You is a contemporary novel, which just happens to be my favorite genre. I really enjoyed the storyline for the book. I like that it kept me guessing on what was going to happen next, and the book definitely went in a completely different direction than I expected it to. I liked that. I also liked that while the book had a bit of romance in it, it didn't overpower the main focus of the story. So many feelings while reading this book, I tell you. So many. Overall; I really enjoyed reading If I Fix You more than I expected to, and I'm excited to read more by Abigail in the future! Her next novel, The First To Know, is set to release in November, and I'm really curious to check it out as well. I have had this on my TBR for quite a while. Glad to hear it was a good read, and that it had a little romance. I am primarily a contemporary romance reader, so I like a little romance in all my books.